Have you thought of bringing unpaid workers on board? Long-term care facilities have struggled to manage staffing shortages since the dawn of the industry. And while pay increases, benefits packages and worker incentives sound great in theory, they’re oﬅen too expensive to implement given our tight budgets. Now, one of our neighbors to the north is taking a more creative approach. 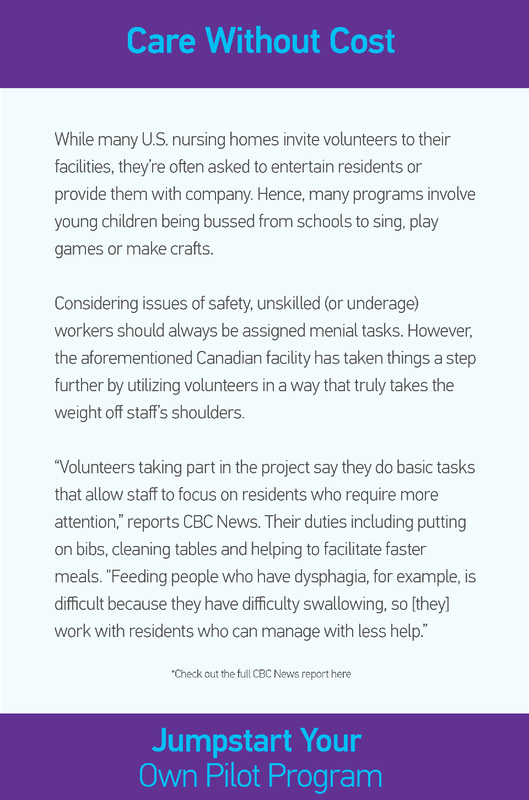 The Frederick-George-Heriot Centre in Drummondville, Quebec, has launched a pilot program using volunteer workers to solve their understaffing issues. In particular, the plan aims to ease staff burden during stressful mealtimes. 1. Start with family. Family members can be some of the most attentive volunteers. They not only WANT to help, but they know your residents like none other. 2. Enlist staff’s children. Many personnel have a hard time paying for daycare, particularly during the summer months. If their kids are old enough, recruit them. 3. Advertise strategically. In local high schools, rec centers and other spots where teens hang out, distribute posters advertising available community service hours. 4. Turn to churches and synagogues. Seek out groups of people who genuinely want to help, as opposed to those looking to fulfill a requirement. 5. Ask for recommendations. When working with student or adult volunteers, ask for a résumé or at least one letter of recommendation to vouch for them. 6. Play the match game. Once you get to know volunteers, pair them up with residents who share similar interests. This helps forge lasting connections. 7. Show your gratitude. Encourage staff and residents to write volunteers thanking them for their service. Ideas include holiday, birthday or ‘thank you’ cards.